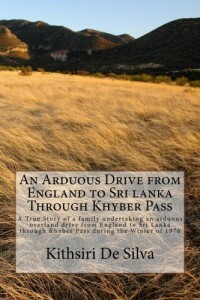 My family of three and a family friend undertook a challenging overland drive from England to Sri Lanka in December 1976. The group comprised of my wife Ranji, our daughter Melani of 5 years, myself and family friend Hugh Seneviratne. This is an attempt to relate somewhat daring, adventurous and interesting events that occurred during this trip as can be recalled from memory and/ or available records. We faced several problems that needed extra patience and foresight to overcome them and at times decisions had to be taken hastily without knowing whether they would be the right ones. We crossed Yugoslavia when it was a single country that is no more possible since it has now been divided as separate independent states into Slovenia, Croatia and Serbia. We have driven a distance of 8756 miles according to the car Odometer although the total mileage calculated from consolidated maps was 249 miles lesser at 8467 miles. This difference could probably be due to errors in not following the planned route correctly. We have used 1192 litres of petrol driving on 17 days and 14 nights over a period of 27 days inclusive of rest breaks and unavoidable delays we had to endure. We have used 12 Hotels or Lodges or Guesthouses on 12 nights during the whole trip when we needed to have a complete rest in the night. We must be the last few who managed to cross Afghanistan from ‘Kabul’ through ‘Herat’ and ‘Jalalabad’ although it was too risky due to local bandits along the route that we were to follow. Even nowadays it is still so due to the prevailing Taliban threat. It appears that visitors are not allowed to use that route anymore due to security reasons. This was evident when I tried to trace the route on the Internet it refused to accept the connection from Kabul to Jalalabad along the Kabul-Jalalabad Highway and indicated an alternate route. The new route follows along the northern border of Afghanistan running through two more countries Tajikistan and Kyrgyztan in the north that would take about 10 days longer. We have travelled on average, 312.7 miles per day based on the number of days driven. The maximum mileage driven per day was 599 miles and that was through Afghanistan in line with our mission to get the hell out of Afghanistan as quickly as possible. The second longest drive was 586 miles in Iran while the third longest drive per day was 566 miles in India. We even took a chance by driving in the night in Afghanistan which should normally be avoided due to the increased possibility of harassment from bandits. Even though this decision was taken knowingly of the possible threats we were more concerned in shortening the period of stay to be an absolutely minimum in Afghanistan. All we could say is that we probably were just lucky in addition to the possibility that there could be lesser number of incidents of harassments in the cold weather! Overall, we have travelled in excess of 400 miles per day on 7 occasions. The longest travel in a country was in India travelling from Wagah Border in the north to Mandapam in the south, a distance of 2239 miles. We were forced to spend an extra day in Pakistan due to temporary closure of the Indian border at ‘Wagah’ border. We had to go back to ‘Islamabad’ in an attempt to obtain special permission to enter India incurring extra mileage. Further, we were stranded in Mandapam in south of India for 6 days awaiting the commencement of the ferry to cross the Indian Ocean from Rameshwaram to Thalaimannar due to a whole island strike in Sri Lanka at the beginning of January 1977. However, we could console ourselves and be happy, since there was no major mishap. We just had one puncture as the only breakdown during the whole trip and reached our destination together safely. 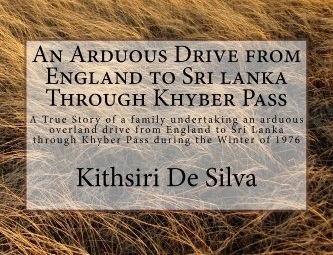 However, my tribute goes to Ranji, my wife and Melani, my daughter and last but not least our good friend Hugh Seneviratne (who is still in London) for the courageous time we had together during the journey. Copyright © "Dominion Group" 2015-2018. All rights reserved.